This film was viewed for the Barbara Stanwyck Filmography Project. 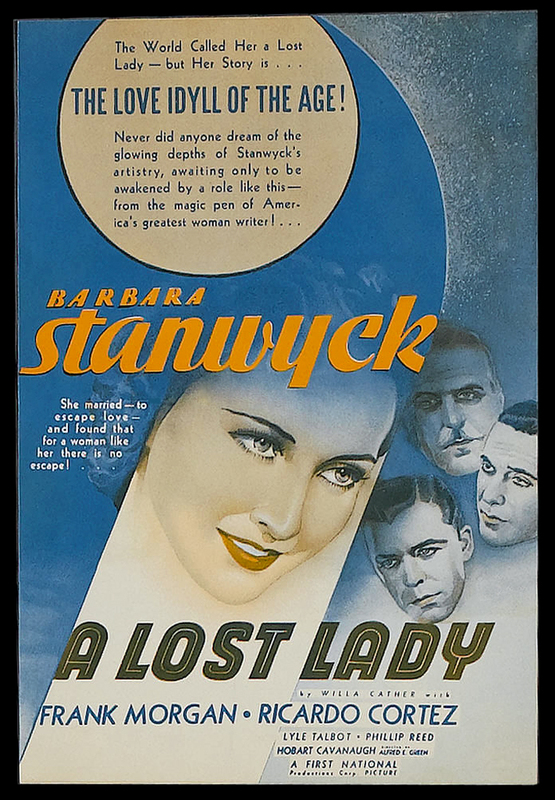 For the rest of the Stanwyck reviews, visit my Listography page! Marian (Barbara Stanwyck) is set to marry her love, Ned Montgomery (Phillip Reed) in less than 48 hours. The two are celebrating their upcoming wedding at a party thrown for them by friends when they decide to leave and spend some alone time together. On their way out of the party, Ned and Marian are stopped by a man who accuses Ned of having an affair with his wife… and then shoots Ned, right before Marian’s eyes! After Ned’s death, Marian’s concerned family sends her to a resort in the Canadian Rockies, an area she loves and used to visit with her mother. At the resort she meets an older man named Dan Forrester (Frank Morgan), who quickly falls in love with her. But can Marian find love again after losing her fiancé? A Lost Lady was directed by Alfred E. Green. The film is based on a novel of the same name by Willa Cather, a prominent American author known for her portraits of life in the West, including My Ántonia. Marian has to be one of Stanwyck’s most interesting characters from the early ’30s — not an easy feat, considering the number of great performances she gave and fascinating films she took part in during this period of her career. Marian is a complex woman, and though the film’s run-time is brief, Stanwyck injects multiple layers into the character. Neither party is under the illusion that the Marian/Dan relationship will be a passionate one; Dan gets a pretty companion whose company he truly enjoys, and Marian gets a secure marriage without the burden of opening herself up to such severe heartbreak and loss again. She’s honest with Dan about her feelings from the get-go, telling him upfront that she will never love him, and that she doesn’t think she can love anyone after what happened to Ned. The film spells this out very clearly through dialogue, perhaps a bit too clearly. It’s Stanwyck that has a real impact on the viewer, making sure the film is emotional rather than wooden even as her character’s feelings are A-B-C’d by the script. 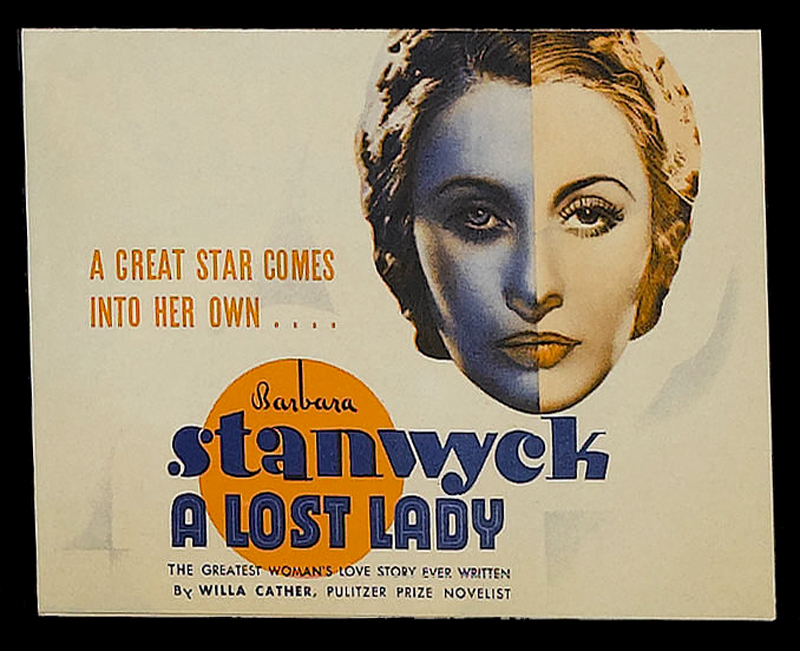 As is the case with many of Stanwyck’s films, her performance is the shining light here. I’ve become a firm believer that there’s no such thing as a bad Stanwyck film, because they’re always worth watching for her performances at the very least. This one reminded me why she’s my favorite actress: she performs with sincerity, regardless of her co-stars, the script, the director, or any of the many factors that play into the success or failure of a screen story. That’s not to say Stanwyck is the only good thing about this film. The story is undoubtedly an oversimplified, cut-and-dry version of Cather’s more intricately-told tale,* but the film holds the viewer’s attention well, moving between plot points swiftly so as not to waste much of its 61-minute run time. Frank Morgan and Ricardo Cortez both give solid performances, though neither can compete with Stanwyck’s screen presence. *Note: I haven’t read the novel A Lost Lady, but have read enough Cather to know that this film must barely scratch the surface of what she wrote. It gets wrapped up in a very “Hollywood” ending, too, which I assume differs from the novel by some measure. TCM notes that Cather was unhappy with both this and the 1925 adaptation of A Lost Lady, deciding after viewing this film not to let any more of her books be turned into movies. I love A Lost Lady. It had such an impact on me when I finally saw it several years ago, that I haven’t been able to shake it. You don’t mention the range of emotions that pass through Stanwyck’s face as Marian realizes what her fiance really is, and watches him tumble to his death. In just second’s, you can see that it’s really Marian’s soul lying dead on those marble stairs. Each time I watch it, it surprises me how short that scene is. In my mind, it plays by in slow motion, beat by beat, heart break by heart break. And I love the entire film just as much as the opening segment. I have read Cather’s utterly unfilmable novella and, trust me, the story of the film is much more compelling. Then there’s the fact that Barbara is on scene for at least 59 of the 61 minutes, and the clothes. So many outfits and so little time. Orry-Kelly isn’t my favorite scene designer, but with the exception of the gown I call “the snake dress”, all the outfits are beautiful, and look beautiful on Barbara. I must have seen it at least 20 times at this point, and see more to Barbara’s performance each time.